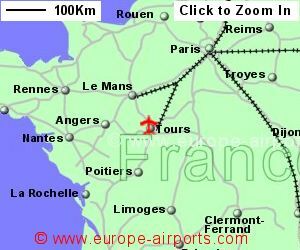 Find and compare the best prices from a range of well known car rental companies at Tours Loire Valley Airport. This is a free to use facility, enabeling you to book direct with the company quoting the price. 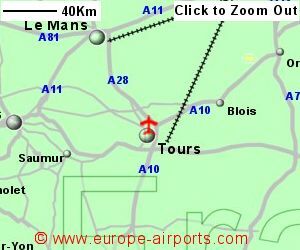 Tours Loire Valley Airport, otherwise known as Airport, is located 4Km North of Tours, in an area well known for its vineyards and the wines they produce. A frrequent tram service runs from Tours train station to Vaucanson, a 10 minute walk from the airport, the 45 minute journey costing 2 Euros. A taxi between the airport and Tours is likely to cost 15-30 Euros. Facilities include a bar/restaurant and shop, function room and VIP services. Tours airport has Airport Carbon Accreditation, at the Mapping level. 198,000 passengers passed through Tours airport in 2016, a 6% increase from the previous year.